If you were to mix together one part Boulder, Colorado, one part Venice and one part Beijing, your result surely would look something like Lijiang, the lovely southwestern town where we just spent a few days. Like Boulder, it’s situated in the foothills of snow-capped mountains. Like Venice, its old city1 is crisscrossed by canals, many of which are still in use. And like Beijing, it’s sometimes overrun by massive Chinese tour groups, which move down its streets seemingly without regard for anything in their path. 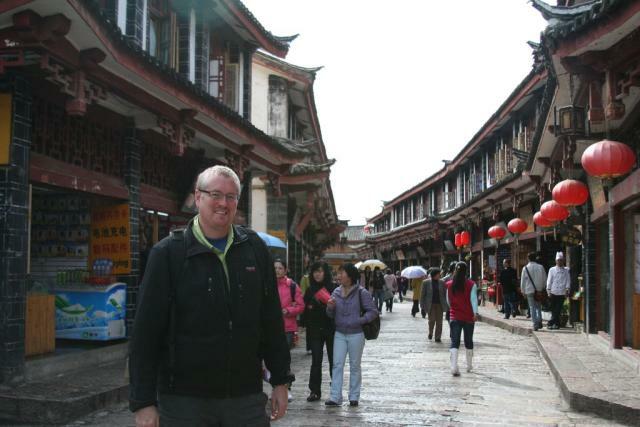 Lijiang is a quaint place, though sometimes more in the Disneyland sense that the charming-village one. We had a wonderful time getting lost (Derek figuratively, me literally!) in its narrow, cobblestone streets. One afternoon, we tagged along with our new Aussie friends, Phil and Viv, and explored two nearby villages that were a bit removed from the normal tourist track. In Baisha, we paused to watch Naxi2 locals playing a hot game of mahjong. In Shuhe, I felt a deep appreciation for the relaxed, travelers’ lifestyle that we enjoy as we sat on a bridge and listened to songs played by a Frenchman and his band of Chinese hippies. On a tighter schedule, we may have passed by this motley crew without a second thought. The next day, I paid a visit to the nearby Dongba Research Institute. 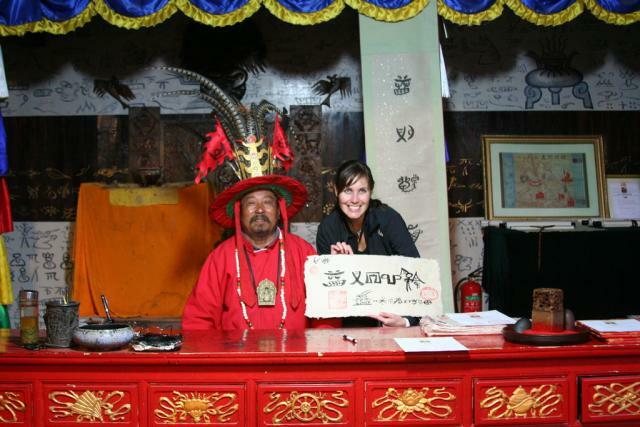 Over 1,000 years ago, Naxi shamans, or Dongba, created an incredible written language that is composed largely of pictograms. The only hieroglyphic language still in use today, the Dongba language is a dying art. 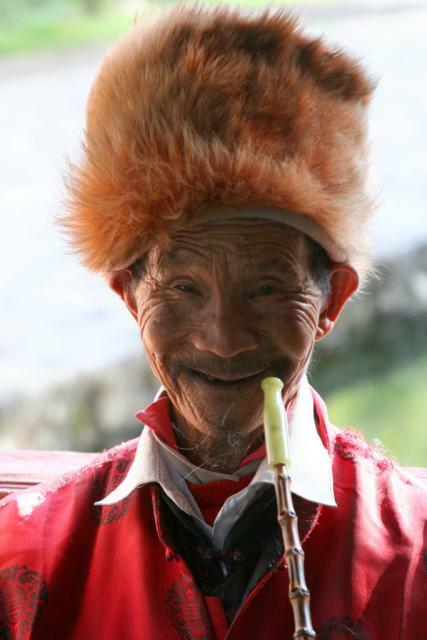 A renowned Dongba scholar (who, incidentally, sports a very fantastic headpiece) was recruited to the institute to teach his ancient art to Chinese students. I was lucky enough to encounter one pupil, who instructed me in the intricacies of the incredible pictographs. I left the institute as the proud owner of a marriage certificate created for Derek and me by the scholar himself. Our backpacks have little room for souvenirs, but we’ll make an exception for this one!